Intro from Jay Allison: Jeff Towne reviews two recent digital audio recorders we’ve been eyeing: the Olympus LS-100 and the Tascam DR-100MkII (Transom review). They are both relatively small, inexpensive, and have XLR mic inputs, which we strongly favor. For the needs of radio producers, one recorder gets a very positive review. The other doesn’t. I’ll leave it at that. Jeff will give you the whole story, with photos, sound files, etc. 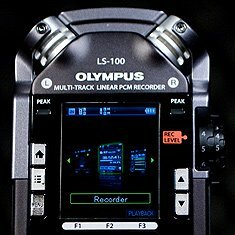 When first released back in 2008, the Olympus LS-10 was a revelation: it was a small, affordable recorder that sounded good. It was one of the first small recorders that we felt confident about recommending without a long list of exceptions. The built-in microphones sounded good, it had a smooth, quiet input gain knob, and it even worked pretty well with most external microphones. The recorder could fit in a pocket, it ran on two standard AA batteries, and it even had speakers for easy monitoring. The main shortcoming of the LS-10 was that the input for an external microphone was a mini-jack. Of course mini-jacks make sense on small recorders: there’s usually not enough physical space for two XLR inputs on a pocket-sized case, but mini connectors are not as robust as XLRs: the jacks can bend, the sockets break more easily than XLR connectors, movement of the cable in the jack can create noise or drop-outs. XLR connectors, especially those with latches, are generally more reliable in the field, and standard XLR mic cables are also more easily replaceable than an XLR-to-mini adapter cable. Also, mini connectors cannot transmit phantom power, meaning that some condenser mics cannot be easily used with recorders with mini inputs. Dynamic mics don’t need phantom power, and some condenser mics have internal batteries that can provide it, but it’s sometimes helpful to be able to feed phantom power from the recorder to a condenser mic. So we were excited by the arrival of the Olympus LS-100. It’s larger than the LS-10, but it has the desired XLR mic inputs, and includes a long list of new capabilities. There’s still a mini jack mic input if one wishes to use it, but the main inputs are on combination XLR/quarter-inch jacks at the base of the machine. It can provide phantom power to condenser mics, and even allows switching power on or off for the left and right inputs individually, which can help preserve battery life. 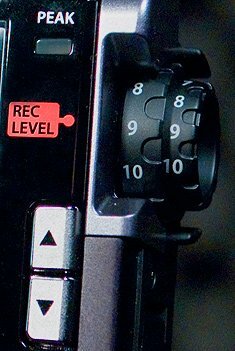 Despite those professional-level improvements, I’m sorry to say that the LS-100 is largely a disappointment, at least as a recorder for journalists. It may be a good machine for other purposes; in fact, many of the new capabilities seem oriented toward musical production. There is a multitrack recording mode, a built-in tuner, a metronome, and even an oscilloscope display for checking phase relationships. But along with those new fancy bells and whistles, there are several changes that make the LS-100 poorly-suited for a reporter’s kit. When it was first released, the LS-100 suffered from latency in the headphones – that is to say, a short delay between the sound being picked up by the microphone and it being reproduced in the headphones. Thankfully, that issue has been fixed in a firmware update, but a few other functional problems remain. The biggest one is the powering. The LS-10 ran on easily sourced AA batteries, but the LS-100 only has a proprietary rechargeable Lithium-Ion battery. That battery is pretty good, it can last up to 10-12 hours if you’re being conservative with screen illumination, recording WAV files, not MP3s, and not using phantom power. But if the battery runs down while you’re out in the field, you’re out of luck. It is removable, so one could certainly purchase a spare or two to swap-in (they cost about $45 each), but do you really want to invest in batteries that work only in this one device and make sure to keep them charged? The battery charges in the recorder via USB, there’s not an external battery charger. You can operate the LS-100 on USB power, so any device that supplies standard USB power (like a phone charger) could be used in a pinch, but that’s not always convenient. Regardless of potential work-arounds, it would have been preferable to be able to use standard AA batteries like most other similar recorders. Another significant drawback is its complicated operation. Of course, any device has a learning curve, and once one gets used to the quirks, operation is smoother, but the LS-100 erects some irritating hurdles that must be jumped over just in order to record. When out in the field, it’s often important to get up and running quickly – ideally a recorder will start recording when one hits the record button. Not all recorders will do that as smoothly as we would like, but the LS-100 is especially irritating in this respect. It powers-up fairly quickly, but after it starts, pressing the record button simply evokes a screen scolding you to select the “Recorder” mode. OK, I just pushed the Record button, I probably want to be in Recorder Mode, can’t you just go into Recorder Mode? Wait, it looks like it is in Recorder Mode by default, but no, the LS-100 wants confirmation, so I need to hit the OK button, which elicits a beep. Now can I hit record? Nope… not yet. Now a screen has come up with a list of folders, and I must choose a folder to store my files. The first one, the default, is fine, so I’ll hit OK. Beep. So, now I hit record again, am I recording? Nope… it’s in record-pause, which is good for checking levels, but we’re not rolling yet, so if events are unfolding, you’ll need yet another press of the record button to start rolling. So, after powering-up, that’s a minimum of four button-pushes (and three beeps) in order to start recording. Every time you want to record. Once you do finally get rolling, the screen dims, then turns off completely, which is great for preserving battery power, but no good for monitoring levels. If you want to watch the input meters, an important thing for conscientious recording, you need to set the screen to never dim, but that will burn battery life. You could record with the screen dark, the record button is lit solidly to indicate recording in progress, and there are peak indicators that would warn you if levels were getting too loud. But it’s not as good as watching the actual level meters, and you’ll get no visual confirmation of time remaining, battery life, and other important functions. It’s a little unsettling to stare at a black screen while making a critical recording. To stop the recording with the screen dimmed is annoying: pressing stop does not stop anything – the first button press simply wakes the screen up, it takes a second press of the stop button to actually stop the recording. The input gain controls are well-designed, on nested knobs that move together, but that allow the left and right channels to be set independently to compensate for different microphones with different sensitivities. The built-in mics sound good too, capturing a vivid stereo soundstage. As is the case with most built-in mics, they are pretty sensitive to wind and to handling noise on the body of the recorder, but when handled carefully, the LS-100 can be an effective stand-alone recorder. It’s a little too large to comfortably fit in a pocket, one of the appeals of the earlier LS-10, but it’s slimmer than the Tascam DR-100mkII, or the Marantz 661 (Transom review). It comes with an elegant zip-up case that protects the recorder nicely, but has no room inside, or pockets outside, for cables or windscreens or other accessories. In a nice change of pace from most recorders, it does ship with an AC power supply, which connects via the mini-USB port, and can charge the battery, or operate the recorder for expended periods of time. That said, the price is higher than most comparable recorders (about $400 at the time of this article). You can get similar sound quality, and much smoother functionality, for less money with the Tascam DR-100mkII. You can even do multitrack overdubbing for less with the Zoom H4n (Transom review) (although the LS-100 offers more tracks, 8 in all, though only two can be recorded at once). Recording with a single external microphone can be annoying: the signal only appears in one ear of the headphones, even when in mono recording mode. This is a pretty common thing to do when conducting interviews, so it’s frustrating to not be able to clearly hear what you’re doing. The headphone output is a little weak in general, making it a challenge to effectively monitor your recording and catch related problems like handling noise or P-Pops. Getting into mono recording mode requires going to an unexpected place as well. It’s in Menu>>Rec Format, and you then scroll through a long list of sample rates and bit-depths, until you find 44.1 khz/mono. The display does switch to displaying only one bar on the level meter, so you have a visual confirmation that only one track is being recorded. Sadly, as mentioned, the headphone monitoring does not switch to playing audio in both ears. So, if you’re looking for a portable multitrack studio for composing music, the LS-100 might be what you’re looking for. If you intend to collect interviews and field recordings, there are less-expensive, easier-to-use options. 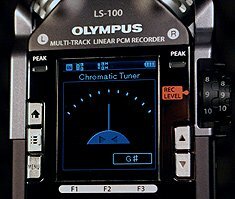 But if you’re willing to put up with some annoyance in navigating the functions, the Olympus LS-100 can deliver high quality audio. The LS-100 has high-quality internal mikes though they’re not as clean as those of the Sony PCM-D50. One major problem with the LS-100 is that blowing into the sides of the recorder quite strangely produces dangerous effects as if one were blowing into the mikes without a wind screen. A wind screen can’t take care of this issue as it can’t cover the sides. 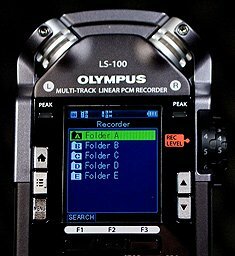 It’s also worth mentioning that the LS-100 (like many Olympus recorders) has Voice Guidance — quite useful to the visually impaired for accessing recorder options and folder names. In order for folder names to be announced, though, one should update the recorder firmware. 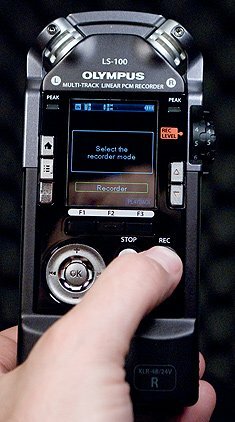 Has anyone tested the multitrack functions on this recorder so we can hear a finished or near finished product with lets say guitar, bass, vocals etc.? The multitrack music production thing is a little outside of our focus here at Transom: we’re oriented more toward storytelling and collecting ambience, and journalistic interview-y stuff. Of course we’re always inspired by people finding different ways of doing things, but it’s my personal opinion that the multitrack layering approach is much more effective when done in a computer, which gives many more options and control than building a mix inside a tiny recorder. That said, if we come across any good examples of multitrack productions done entirely on an LS-100, we’ll be sure to link to them! Thanks a lot for the great reviews. Very helpful to shorten my shopping list. I come from a musician’s standpoint so I’am looking for different things than you guys but still find the reviews very informative. i’ve been comparing your audio demos of the D50, DR-100mkII and LS-100 and to my musican’s ear the LS-100 is the better sounding one by quite a margin for both internal and external mics. I was considering using a D50 as a “bit-bucket” for a USBpre2. But the LS-100’s preamps seem to be clean enough to not have to buy two devices. I have now narrowed it down to either the LS-100 or the Roland R-26. If I can just find some good audio demos of the Roland, I’ll be able to make my final decision. I use a portable cell phone charging brick for added power. The POWERGEN brick will run the LS100 for hours. $30 or so on Amazon. Hi! 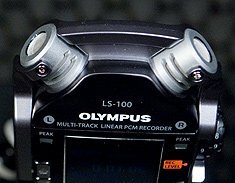 Could you, please, tell how did you connect external microphones (for example, Audix i5) to the XLR inputs of Olympus LS-100? I mean, if I connect Audix i5 to one XLR input of LS-100 via XLR or jack I get only mono recording in a result? Hi I purchase the LS-100 after having my LS-11 Stolen, I use it mainly for the line in through a mixer or mixing desk to record Live Mix’s at gigs & the LS-11 was fantastic for this. However with the XLR Line in I can’t get a decent recording it just distorts & the only time I managed it with a tiny output from a laptop & the record on 1 – Maybe I’m best sticking to LS-11? Any thoughts?